The Oregon Archives Crawl is organized and run by volunteers with the goal of hosting the event every other year. While the Crawl is not happening in 2019, archives throughout the region will be celebrating Archives Month in a variety of ways in October. Check back later to find out about Archives Month Activities for 2019. Remember: any day is a great day to dive into local history! This entry was posted in Uncategorized on March 7, 2019 by portlandarchives. The Oregon Archives Crawl is back in 2018! Join us Saturday, October 20th to explore Changing Attitudes. Archives document how communities, beliefs, practices, and preferences have changed over the years. Historical records and photos can shed new light on common beliefs or explain how things have come to pass. With more than 30 organizations participating, you are guaranteed to discover something new! This entry was posted in Oregon Archives Crawl on July 13, 2018 by portlandarchives. The Oregon Archives Crawl is returning October 20th and we want to make sure you keep your calendar clear so you can join us! October is National Archives Month and we would love for you to join us at the Archives Crawl to help us celebrate archives, history, and the people and organizations who work hard to collect, preserve, and make these historical records available to you. The host sites for this year’s Crawl are: the City of Portland Archives & Records Center, the Oregon Historical Society, and the Multnomah County Library (Central Branch). Participating organizations will be announced at a later date. Keep an eye on this page for updates and information. This entry was posted in Uncategorized on January 26, 2018 by portlandarchives. We have started planning for the next Oregon Archives Crawl beginning with setting the date – Saturday, October 20th. Check back here for more details in the coming months. See you October 20th! This entry was posted in Uncategorized on January 5, 2018 by portlandarchives. The Oregon Archives Crawl is organized and run by volunteers with the goal of hosting the event every other year. While the Crawl is not happening for 2017, archives throughout the region are celebrating Archives Month in a variety of ways. Listed on this page are activities for you to enjoy, or check out these local organizations to see what they are up to. This entry was posted in Uncategorized on September 12, 2017 by portlandarchives. This year we worked with two graphic design students to create the 2016 Oregon Archives Crawl poster. Both Lauren and Kylie created such unique and appealing designs that we couldn’t choose between the two. So this year we have two posters for the crawl and we couldn’t be happier. You can learn more about both graphic designers by visiting their websites. This entry was posted in Oregon Archives Crawl and tagged Oregon Archives Crawl on August 11, 2016 by portlandarchives. 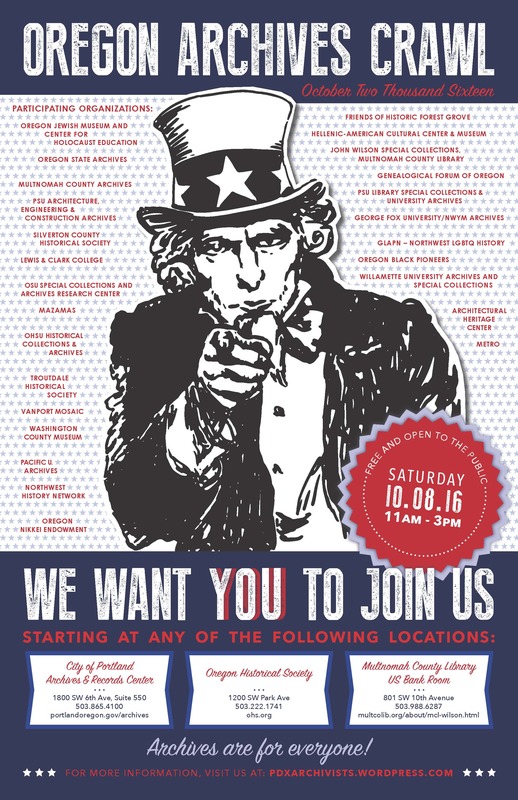 We want YOU to join us for the 2016 Oregon Archives Crawl! The Oregon Archives Crawl is back and we want YOU to “crawl” between the City of Portland Archives & Records Center, the Oregon Historical Society and the Multnomah County Library where you can explore our region’s history with 28 local archives, special collections and heritage organizations. Celebrate National Archives Month while discovering the wealth of information that can be found in your local archives. Whether your interests include the history of Japanese internment, the impacts of urban renewal on Portland, or resources for finding your family’s history, the Oregon Archives Crawl has something for everyone. We call upon young and old, history buff and scholar, vintage photo lover, genealogist, building researcher and those who are just curious to stand up and be counted on Saturday, October 8th between 11 and 3. 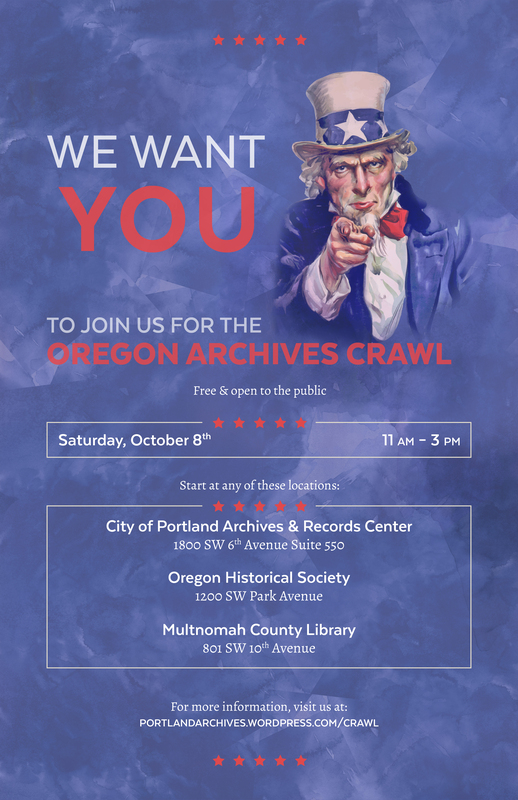 Archives are for everyone, so show your support by attending the 2016 Oregon Archives Crawl!